It is the worst of times. It is a time when state legislatures are making draconian cuts in services in order to make up budget shortfalls. In the case of the state of Idaho, Governor Otter has proposed cuts in public and higher education, Idaho Public Television, the Department of Parks and Recreation and the Department of Health and Welfare. These cuts will not just have an impact of this year’s budget. Once agencies are slashed, they can not easily be reconstructed. What is even more tragic about these cuts is that they are unlikely to save the state money in the long run. There are hidden costs have been ignored in the rush to cut. One example: The $1.6 million the state would save by cutting off funding for Idaho Public Television may be less than the amount IPTV has to repay the federal government for portions of $4 million in grants. The grants paid for equipment to convert the statewide TV network to digital signals, and if the equipment isn’t used for its intended purpose for 10 years, repayments are due. Another: Gov. Butch Otter’s initial proposal to eliminate the state Department of Parks and Recreation and sell its headquarters building sought to save $10 million, but it could have cost the state the landmark Harriman State Park, likely worth $50 million. That’s because the Harriman family’s gift of the park to the state was contingent on Idaho setting up a professional parks department. Once the Harriman Park issue became known, Otter dropped that plan in favor of a more modest proposal to cut costs at state parks and lay off 25 employees of the agency. At the state Department of Health and Welfare, every $1 cut in state funds means losing $3.75 in federal money, too. Budget cuts there over the past two years have cost the state $120 million in federal funding. In other words, Otter and the other Republican ideologues have been itching for an opportunity to take a gigantic “bite out of government” and the current economic crisis is just that opportunity. 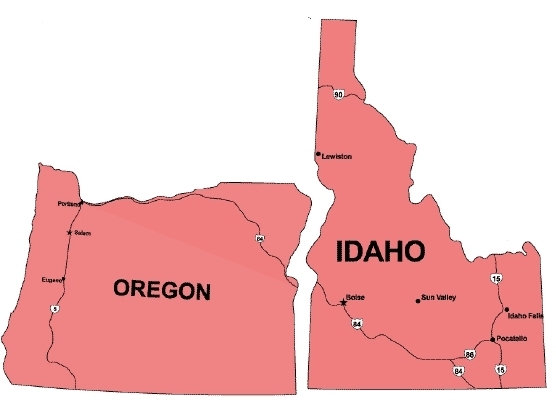 Oregon, Idaho’s neighbor to the west faces a similar shortfall. Their solution was one Idaho’s libertarian Governor and majority Republican party would never consider- raising revenue. A little over a week ago, Oregon passed two tax measures, 66 & 67, that raise the corporate minimum tax from $10 to $150 and raise the tax rate on household income above $250,000. Back in 1930, voters in Oregon approved a state income tax. They haven’t voted, statewide, for a tax increase ever since. Until last week. Oregon voters on Tuesday gave healthy majorities to two initiatives that will hike taxes on the state’s corporations and wealthy. Affluent Oregon couples will see their tax rate on income over $250,000 rise by 1.8 percent. Oregon millionaires, even with the increase, will still be paying state and local taxes at a lower overall rate than the poorest fifth of Oregon households. But the children in those households will now be attending public schools spared the cutbacks that would have been inevitable without last week’s tax-the-rich triumph. Notes Karen Kraut, an organizer with the Boston-based United for a Fair Economy: “The remaining 49 states would be wise to follow in Oregon’s footsteps.” State governments are currently projecting a $102 billion budget shortfall for the upcoming fiscal year . . . Sorry to say this to the average working person, but the class war has already been fought and you lost. 2) The measures passed because the liberal hippies in Multnomah County voted for it. So it’s remarkable enough that both measures passed, and fairly comfortably, with Measure 66 (raising taxes on upper incomes) getting 54.3 percent and Measure 67 (business taxes) winning 53.6 percent. What’s especially astounding is that Multnomah County was almost a bit player. Measure 66, in fact, was leading by 5,000 votes before the counting ever reached the Multnomah County line. (Multnomah then tossed in its margin, just more than 100,000.) Measure 67 barely trailed, by 11,500, outside the state’s most populous county. 3) The tax increases will drive away business. Entrepreneurs will flock to states like Idaho that are “business friendly”. So Oregon’s vote, coupled with Idaho’s deep cuts in education, social services and all state government services, gives people on both sides of the issue a real chance to prove who is right. Will the state that raises taxes to protect schools and services do better economically than the state that keeps taxes low? Will Idaho place billboards on Oregon’s Interstate 5 saying “Come to the state of low taxes on the rich and corporations?” I heard some lobbyists say this might be a real opportunity. Here is the problem Rocky, even after the passage of measures 66 & 67, Oregon has a better business tax climate than Idaho. 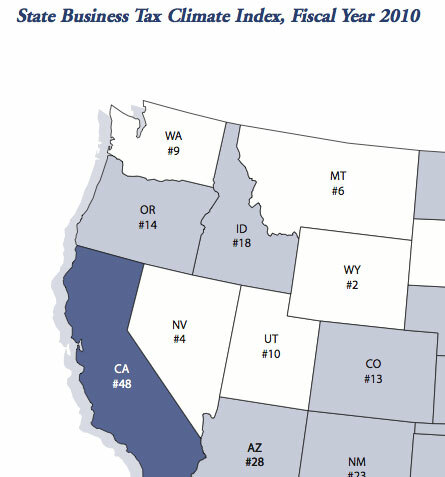 In fact, according to the just released 2010 State Business Tax Climate Index (which factors in measures 66 & 67 to the Oregon ranking), Idaho ranks below all of its surrounding states. I would hold off on putting up the billboards just yet.